Sometimes good people, even excellent students at Xavier University of Louisiana, find themselves in bad situations with an MIP (Minor in possession) ticket as the result. Parties and social gatherings on or near the Xavier University of Louisiana campus can lead to you or your child being charged with minor in possession of alcohol ticket. While many students view underage drinking as a rite of passage, you or your child faces serious, lasting consequences if convicted of underage drinking. Depending on the situation, you or your child could receive a permanent criminal record, which could be viewed by future employers and school officials. 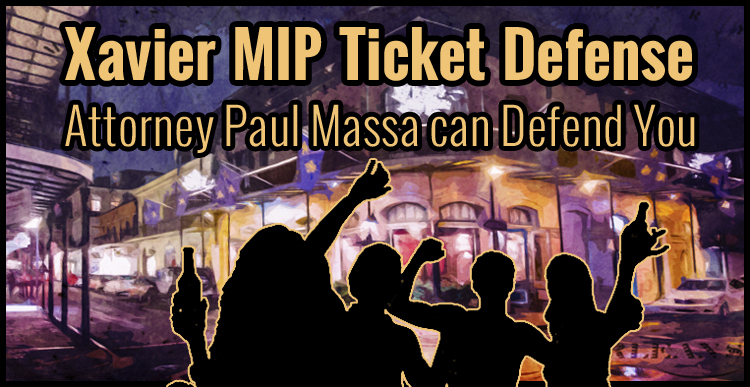 MIP Attorney Paul Massa has been defending clients at the New Orleans Municipal court since 1991. He has helped college students from Xavier University of Louisiana and young people across Louisiana to defend their rights and keep their underage drinking ticket off their permanent records. The number one most important step to take is – Do Not Plead Guilty or Pay a Fine to the City of New Orleans, or State of Louisiana, for a Minor in Possession (MIP) summons, citation, affidavit, ticket or arrest before you understand the consequences of being charged and convicted of this municipal misdemeanor. Simply stated, a guilty plea on your record for the next 10 years can adversely effect your ability in the future to get a job, college of choice, or membership to a professional guild. Leverage the legal experience of a New Orleans Minor in Possession Lawyer Paul Massa to work for your defense to successfully resolve this criminal misdemeanor MIP charge TODAY. A relevant news report/editorial that provides an insightful background to the New Orleans MIP charging epidemic in the city named MIPs, misplaced priorities can be viewed here.